It’s hard to say anything bad about Dennis Kucinich. It has been scientifically proven that he’s the one presidential candidate that Americans agree with on nearly every major issue. And then there’s his wife, Elizabeth. If he’s good enough for her, he’s good enough for America. Still, I have my doubts about where the Kucinich campaign is headed with its recent move into Second Life. Kucinich is the second presidential candidate to officially authorize a campaign presence in the virtual world (behind Mike Gravel who has been here for almost six months). Somehow the title “Second Presidential Candidate in Second Life” doesn’t have much of a ring to it. When you’re running well behind the rest of the pack in real life, second place in the Metaverse doesn’t count for much. I probably wouldn’t be so harsh on the Kucinich campaign if it appeared that there was a method to their madness. Unfortunately, after several visits to their new Second Life location, I’m almost certain there is no plan. While I’ve said that second and third tier presidential candidates need to be more aggressive in their use of new media, I’m starting to think that Second Life may be the exception to this rule. Second Life is the most social of social networks. It requires a much higher degree of user interaction than a website does. In many ways, Second Life is the antithesis of the web. While the web holds the promise of automating all consumer interaction, Second Life demands real-time interaction. Without interaction Second Life is nothing but a ghost town, and, unfortunately, that’s what the Kucinich headquarters looks like right now. Ironically, while Second Life is all about real-time interaction, it also happens to be one of the smallest social networks. It’s true that Linden has signed up over 9 million users, but the number of active Second Life users is substantially smaller. The world peaks at around 50,000 concurrent users at any one time. That may sound like a lot, but it’s a fraction of the number of concurrent users served by sites like YouTube and Facebook — sites that aren’t nearly as dependent on real-time interaction. Consider the resources required to staff a virtual campaign headquarters 24×7 just to maximize the user experience for a couple of hundred visitors who might stop by your location, and it’s easy to see that a campaign with limited funds is probably better off spending its time and money on other new media options. It’s no wonder that a group of new media experts from both parties recently expressed skepticism about the usefulness of Second Life as a campaign tool. 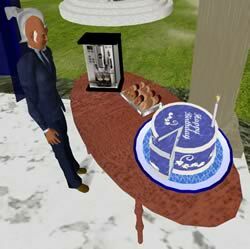 As the recent Newt Gingrich event proved, there is an opportunity for staging real world political events in Second Life. However, they have to be carefully planned events that facilitate interaction, rather than open ended installations that simply point users back to the web. The challenge, of course, is that candidates are too busy running for president to spend an hour or two in Second Life. In retrospect, we should have known that Newt wouldn’t be running for president the moment he teleported onto the steps of Capitol Hill. To be fair, the Kucinich campaign seems to be doing well on other social media sites. YouTube in particular works well for this candidate — especially the videos that include his wife, and he seems to be making the most of Facebook and MySpace. There are also quite a few photos of the candidate in action on Flickr, although the campaign could probably do more to encourage supporters to submit photos from various stops around the country (the last update was August 29th). Meanwhile, the campaign falls flat on some of the other social media platforms. There are still no entries on the Kucinich blog, and while he has a twitter account, he still hasn’t posted anything yet. That’s fine. I don’t necessarily want a presidential candidate to be sending SMS messages from the campaign trail, but, as others have noted, these half-hearted efforts make it seem like the campaign simply went through a new media checklist, dutifully checking off every popular social media platform once they had created an account. It’s surprising to see such a progressive candidate take such a conventional approach to new media. 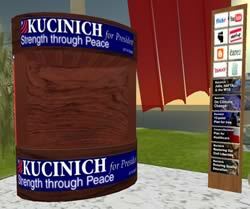 Having said all of this, I should note that the Kucinich campaign did hold an event in Second Life earlier this week. Monday morning I received an IM inviting me to a cake party to celebrate the candidate’s 61st birthday. Seriously, I avoid those sorts of things in real life, there’s not a chance in hell that I’m going to a virtual cake party. Besides, I know that there’s always something left after the party is over. Sure enough, the next afternoon I dropped by the Kucinich HQ only to find a platter of donuts and a birthday cake looking virtually untouched. Something tells me this isn’t really the future of American politics.